2 Bedrooms, 2 Bathrooms, Sleeps 4. On the Big Island of Hawaii, we are located at sea level in the last fishing village of quiet, rural Milolii on an ancient lava flow, with lava coastline. Located 33 miles south from Kailua-Kona, we are just a short 63 miles to Volcano National Park. Approximately 1-1/2 hours drive south from the Kona International Airport. We are equi-distant between many popular tourist sites located on the Kona Coast side of the Big Island, i.e. Kealakekua Bay, Place of Refuge, Kahalu'u Black Sands Beach Park, Honomolino Bay, Punalu'u Black Sands Beach Park, Volcano National Park, to name a few. OCEANFRONT Hale Romantik' on the Big Island of Hawaii, South Kona Coast is located just 40 feet from the ocean. Feel the beauty, sound and excitement the Blue Pacific brings to you. When the high surf impacts the cliff below, causing and occasional surge, sending a fine spray all the way above the deck, it makes a shaking sensation to the house in a surprisingly pleasant manner. You will not have to look for the whales. You will hear them! And then look! There are also Spinner Dolphins, Green Sea Turtles and occasionally Manta Rays all year long. The waters in this location are considered some of the best KAYAKING and fishing grounds in Hawaii. Snorkeling equipment and Kayaks are also available for your use, on the property. This oceanfront home has open beam ceilings throughout the house, adding to the sense of space; great for air circulation and a true feeling of Polynesian design with the exotic beams and designer palm fans dramatically displayed above. Italian porcelain tile throughout; simply a pleasure for your stay. The home has all amenities, including a 500 sq. ft. lanai. Large expanses of windows and sliding doors, connect the home to its ocean views, allowing you to view the ocean from nearly every room, even from each bedroom. Every night you will watch the sun set below the horizon. This oceanfront home is simply immaculate and fully equipped. Has all what you need. We cater to the particular! The home has two deluxe bedrooms, with their own ensuite is very convenient. Two separate deluxe bathrooms with double vanities, with extra large porcelain sinks, and two separate walk-in tile and glass block showers is another highlight. Milolii is known throughout the islands for its deep sea fishing, and clear waters. The 'last fishing village' in Hawaii is just a 10 minute drive within the Milolii Beach Lots subdivision, where a trail leading to a coconut tree lined black sand beach (Honomalino), offers fantastic snorkeling. The village has a County boat ramp and camp grounds, and offers easy access for kayaking and deep sea fishing. Milolii offers some of the most underdeveloped stretches of coastline on the Big Island, with secret beaches to explore. Seasonal whale watching and Spinner Dolphins. As many as 10,000 Humpback Whales visit the Hawaiian waters annually from November through May. These endangered mammals enjoy the state's warm waters in the winter to breed, give birth and nurse their young. Spectacular sunsets can be viewed directly from the oceanfront house. Have your camera ready! Milolii......'where the sun meets the sea', and everyone says hello! 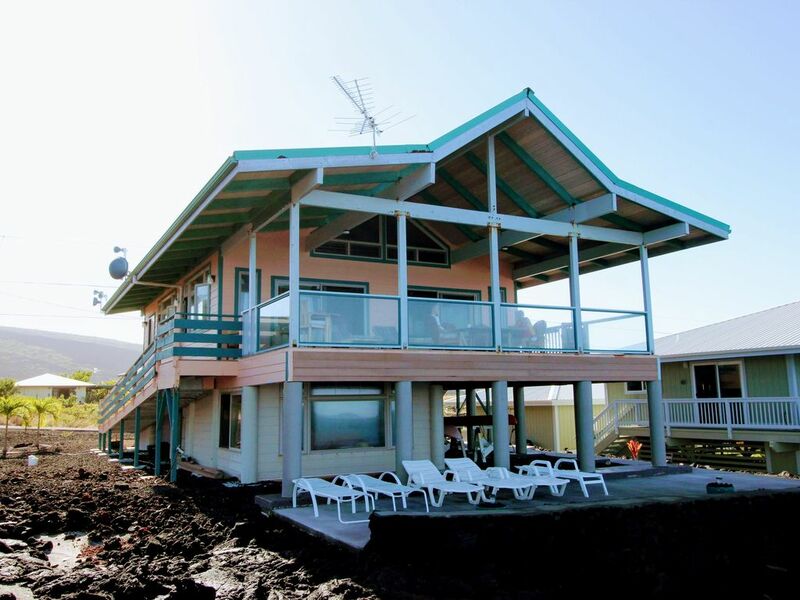 Located equi-distant between many popular tourist sites located on the Kona Coast side of the Big Island. Love being directly oceanfront and watching the sunset over the ocean. I enjoy the winter waves as they crash along the coastline. We do not take bank-to-bank transfers. We do not take Western Union or Money Gram payments. Cancellation Policy: Cancellations must be made 60 days prior to your arrival date. Booking Policy: No refunds will be issued unless we can re-book our vacation rental for the dates in question. No refunds will be given on shortened stays. Bathrooms have granite counter tops, oversized double vanity sinks, with glass block walk-in showers. The house is complete; has everything you need! Just bring your toothbrush! Coin Operated to help defray the cost of water delivery service, and high maintenance being on the oceanfront. PLEASE SUPPLY OWN LAUNDRY DETERGENT. Coin Operated to help defray the cost of water delivery service, and high maintenance being on the oceanfront. Microwave and Toaster Oven available. Complete with electric grill, microwave, toaster oven, blender, rice cooker, slow cooker, coffee grinder, and brewer. Dining Table for inside eating. Large Lanai teak table for outside dining. Large Lanai to watch sunsets over the ocean. Two Tandem Kayaks with gear, available on premises. Snorkeling gear available on premises. A RAMP FOR EASY ACCESS. JUST WALK-UP. TOO SMALL-GRADE STEPS AT TOP OCEANSIDE, LEADING TO LANAI. Ramp For Easy Access. Just Walk Up. Milolii properties are on catchment systems. Spring Water purchased from private water delivery companies are pumped into water tanks. Please supply your own bottled drinking water. Thank You. Amazing views and amazing quiet! Far away from everything - you have to drive to get anywhere - but we knew that. Beautiful sunsets in perfect accommodations! Spent a wonderful 5 days at the property which is literally on the edge of a lava cliff with unobstructed views of the Pacific. Saw countless whales feeding off the deck and would even hear their blowholes at night as they passed close to the cliffs. The property is quite a drive south of Kailua-Kona and the main resort areas but closer to Volcano and Hilo so it all depends on what you want to be nearer (everything is a drive to get to on the Big Island). It is a good 15 minute drive just from the main road down to the property given the elevation from which you start and the switchbacks, but the views are spectacular and the drive easy if you take it slow (also various farm stands along the way to stop and get fresh bananas, avocados and other fruits). The town of Oceanview is only 25 minutes away from the house if you need groceries/gas or want to go to their farmer's market on Saturday morning. You do need to bring in your own drinking water to the house since its on a catchment system (as are most houses on the island). Milolli state park is just 5 minutes drive down the road from the house where you can do some great tidal pool exploration. If you hike out to Honomalino Bay from there you will likely have the entire black sands beach and bay to yourself (the trail is now well marked, about a mile hike through very surreal landscape and forest). Unfortunately we didn't get to kayak or snorkel there or at the house as the seas were too rough (an unusual storm passed through leading to a lot of unusual wind and rain while we were there), but the sunsets, whales and quiet were wonderful. Definitely a great place to unwind and get away from it all. Kitchen is also well equipped so if you like eating in you'll have no problems doing so and then enjoying the view from the lanai or patio. Relaxing away from the hustle and bustle. This was a beautiful property that was very comfortable and well stocked for our long vacation. The beds were very comfortable. The two main bedrooms on the main floor were very roomy with fantastic bathrooms. They were plenty of towels and beach towels. We were able to bring beach chairs, and umbrella and boogie boards to the beach that were provided by the rental house. There were plenty of lounge chairs on the patio and a nice eating area on the deck. The view was fantastic. It was fun watching the waves and looking for marine life. There were kayaks available for our use but we didn’t use them as it would have been difficult to launch them from the area close to us. We found some nice beaches between Milolii and Kailua Kona. Our favorite was Hookena Beach. Two step and Captain Cook were not too far. The Green Sand beach on the southern tip was also a fun place to go to. The owners were super easy to work with. Thanks for sharing your house with us! A very beautiful spot - it was ideal for our family. We spent quite a bit of time sitting on the deck reading and looking at the ocean. We also saw some beautiful sunsets. The property is off the beaten path and takes some driving time to get to restaurants, grocery stores and snorkeling. However, for our family, we very much enjoyed the relative solitude. I'm glad you enjoyed your stay at Hale Romantik' in Milolii. It is a pretty special place. Enjoying our stay on the big island of Hawaii. This home is wonderful. There are three bed rooms and three full baths. If you love quiet and seclusion it’s perfect. It’s about equal distance to kona or Hilo (about an hour). Our neighbors have been great. We certainly have been made to feel welcome. Mahalo for the review! I'm happy you enjoyed your time at Hale Romantik'. Keep me posted on your next trip! Beautiful ocean view. Tranquil and serene. We enjoyed our stay in this oceanfront house off the beaten path in Milolii. The home is beautiful with a nice floor plan. My favorite part - the lovely lanai. What I was not fond of: The steep winding drive from the main road to the house. No direct access to the ocean from the property. These two reasons brought my rating from a 5 to a 4 star. Mahalo for the review! We are happy you enjoyed your stay at Hale Romantik'. Located 33 miles south from Kailua-Kona, Hawaii; just 63 miles to Volcano National Park.We are equi-distant between many popular tourist sites located on the Kona Coast side of the Big Island, I,e Kealakekua Bay, City of Refuge, Kahalu'u Black Sands Beach Park, Honomolino Bay, Punalu'u Black Sands Beach Park, to name a few. $175. night=1-2 guests. Standard Rate: $175.00/nightly = 1-2 Guests. $245.00/nightly = 3-4 Guests. $315.00/nightly = 5-6 Guests. Guests over two: $35.00/nightly for each additional guest. Additional Cleaning Fee for over four guests. Monthly rentals require mandatory two cleanings. Cancellation Policy: Cancellations must be made 60 days prior to your arrival date. Booking Policy: No refunds will be issued unless we can re-book our vacation rental for the dates in question. No refunds will be given on shortened stays. Refundable Damage Deposit $200.00. Transmission and Service Fees additional. We prefer echeck payment to defray the CC Transmission Fees.